Holly was sent away to Cornwall to find a boyfriend in October Half Term. Everyone who was helping with the animal feeding had a great time getting Holly loaded into the trailer. It went very smoothly, apart from getting the land rover stuck in the mud. We were very lucky that one of our regular guests is an agricultural contractor and has a lot of experience of getting vehicles out of the mud. 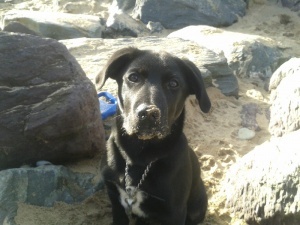 Graeme and Holly had a good journey down to Cornwall and she happily trotted off to make new friends for her holiday. October is also the month for making Christmas puddings and mincemeat to an old recipe from grandma which are absolutely gorgeous and it is always great excitement to get them safely stored in the cupboard. Maple was next off to visit her boyfriend, this time in Dorset leaving us Hazel and Ivy, two gilts who are too young for the boar at the moment. They are having a great time enjoying our full attention! We filled the upstairs of the barn with our winter store of straw as well so we are all set for whatever winter has to throw at us. 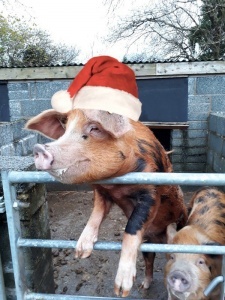 Holly and Maple returned to us during the week before Christmas both hopefully in pig with piglets due during March. Maple managed to get one of the internal trailer gates off its hinge and stuck over her snout during her journey back home. She proceeded to punch holes in the trailer roof while trying to get it off which was very helpful! We now have to repair the trailer in the new year so not much profit from the piglets this year! It has been great to meet so many wonderful people this year. We have seen so many returning guests who are now great friends, which is fantastic. Merry Christmas and a Happy New Year to you all. 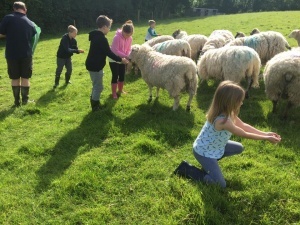 Another summer season completed and a big thank you to all our little helpers (and the not so little ones) who did their bit to look after the pigs, sheep, hens, guinea pigs and the wild ducks. Yes, the ducks from last year are still coming down for their breakfast and tea each day. Everyone really enjoys seeing them. 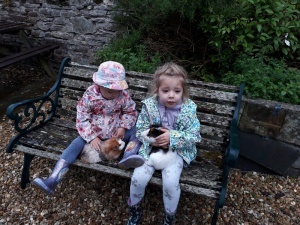 Fudge and Treacle have been having lovely cuddles with the children and thoroughly enjoying the grass and carrot treats that they have fed to them. The Chichester Arms is still a fantastic local pub for a wonderful meal. 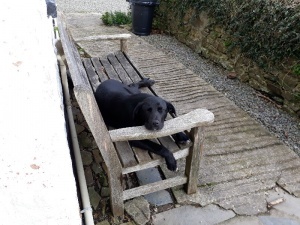 We had a lovely visit to Arlington Court this month taking Farley for a bit of socialisation skills training. He was very good and enjoyed his tour around the carriage museum. He was a bit unsure of the model pony at the end of the upstairs gallery though and didn’t want to go near it! The carriage museum was very interesting and definitely worth popping in. 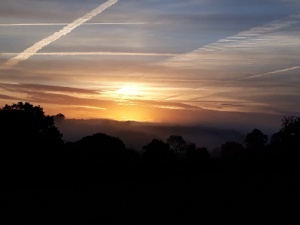 This was followed by a lovely walk around the grounds and then back to the car for a welcome cup of tea and chocolate biscuit. 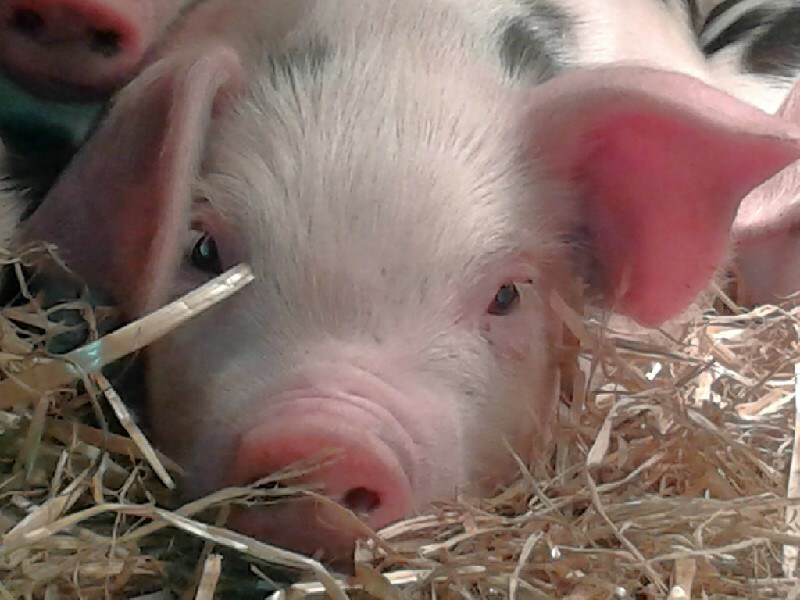 Maple and Holly’s piglets went to their new home at the end of June. It was good to be able to keep them all together. The Grain Store now has a new double mattress with a memory foam topper added as well for extra comfort. As usual, the delivery lorry was too big to get down the lane so the mattress was brought down on the back of our neighbour’s tractor. 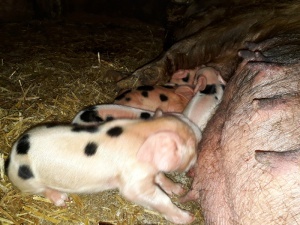 Holly had two piglets on the 5th May which was a lot fewer than we were expecting. 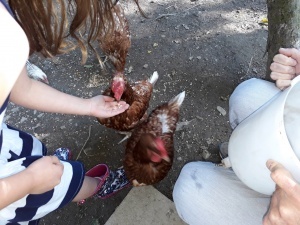 They were both really spritely and inquisitive and were great fun with the children having quite cheeky personalities. The Grain Store now has new bedroom windows which is very exciting. 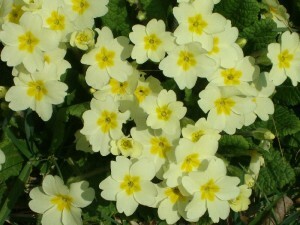 We enjoyed a lovely trip to Marwood Hill Gardens to see the Camelias and Rhododendrons. The gardens are stunning at any time of the year and are only a short drive away from Lower Hearson Farm. Farley was very naughty. He started his visit barking at everyone he saw until he got used to seeing people around but he never quite got over the terrifying sight of a wheelbarrow sitting threateningly in one of the flower beds! We were full up for the entire month of April. It was great to see friends who have been many times before and also to meet some lovely new people as well. We all had a great time. Maple kept us on tenterhooks farrowing 4 days late following a visit from the vet who had to induce her. The drug normally takes 24 to 36 hours to kick in. 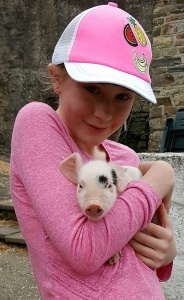 One of our regular guests and now a friend was a star and helped Marilyn to deliver the piglets with her Mum, sister and brother giving moral support from the side lines. Graeme had just chosen the wrong moment to pop out to Sainsburys! 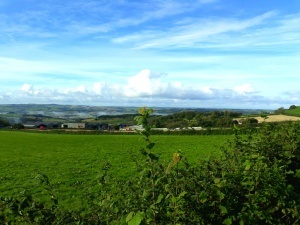 We finally finished the fence in the field just in time for the sheep and their lambs arriving. Nothing like doing things in the nick of time! Maple is getting bigger by the day and we are looking forward to the middle of April when she will present us with her piglets. Most of the other refurbishments have been completed ready for Easter. Just waiting for the new Grain Store bedroom windows which will need to be fitted in May when we next have the cottage free. It has been a busy couple of months carrying out work and decorating in the cottages. The Roundhouse sitting room is having a new oak floor which will look lovely with the new leather sofas and new curtains. With other improvements in the Shippon, Grain Store, Linhay and Threshing Barn the weeks have been flying by. Outside we are putting a new fence along one side of the field and laying some new paving slabs around the swimming pool along with all the other usual jobs. 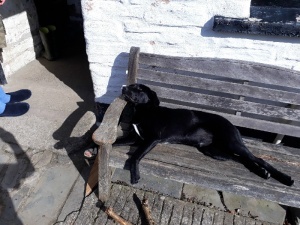 Farley, our new puppy, has been amply entertained with all the excitement that has been going on and we are trying to get to grips with training him. He is going through his over enthusiastic phase at the moment! Maple is “in-pig” with piglets due in the middle of April. 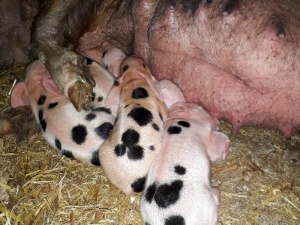 Holly is “in-pig” with her first litter due at the end of April. 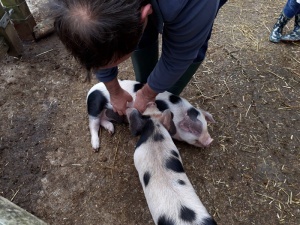 Graeme will try to be on hand to hold both pigs trotters whilst they are farrowing whatever time of the day or night. 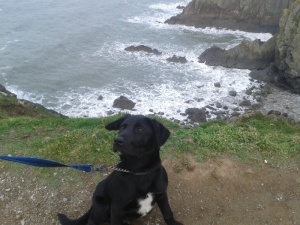 We managed to fit in two trips, one to Baggy Point, one to Putsborough to show Farley the seaside and some cliffs in January. Both outings were great fun and he thoroughly enjoyed himself. See our page.